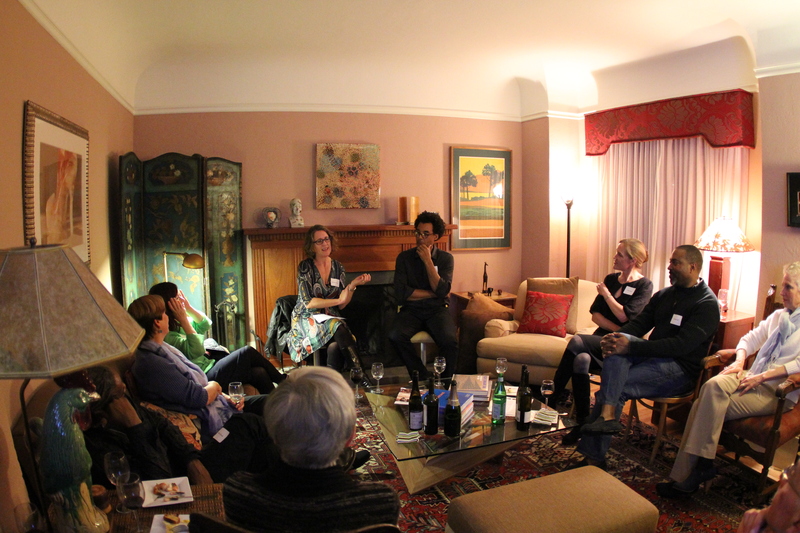 In 2014, ARC reignited its popular Salon program, creating intimate gatherings that give Bay Area arts supporters access to artists and curators on the Berkeley campus. ARC Salons provide intimate forums to explore exciting ideas about arts innovation as well as the most bracing questions about the future of the arts, focusing on the creative work and scholarship of UC Berkeley faculty, alumni, and their inspiring collaborators. There are no upcoming salons at this time. Please join our newsletter should you wish to be contacted about all our events. On August 3, 2015, Associate Vice Chancellor for the Arts and Design, Shannon Jackson, hosted a Berkeley Insights Salon with Actress and Playwright Anna Deavere Smith and UC Berkeley’s Executive Vice Chancellor and Provost Claude Steele. At this gathering, the group had the opportunity to hear Anna and Claude converse about the role of the arts in social change. Anna’s “Notes from the Field,” which was on view from July 11 through August 2, 2015 at the Berkeley Rep , tackled some of the most pressing issues of social equity in our prison and educational systems. Anna’s work was inspired by Claude’s seminal research on racial stereotyping and education—indeed, he was the very first person she interviewed when she started this project. Led by Shannon Jackson, their conversation talked about connections amongst their work as well as Anna’s latest thinking about how the theater space can propel engaged thinking and action. On Monday, March 16, the Arts Research Center, Opera Cabal, Dean Anthony Cascardi, and Professor Thomas Laqueur, hosted a special evening of food, drinks, and a short performance from Kurt Rohde’s new opera, Death with Interruptions. The evening began with a signature cocktail prepared by Shanna Farrell, head researcher for “West Coast Cocktails: An Oral History” project at UC Berkeley’s Regional Oral History Office, and was followed by a performance and salon conversation with Professor Thomas Laqueur, and Opera Cabal Executive Director Majel Connery. In March, the Left Coast Chamber Ensemble presented three performances of a new dramatic musical work based on Nobel Prize winner José Saramago’s novel Death with Interruptions. With music composed by Kurt Rohde and a libretto by Professor Thomas Laqueur, the story recounts what happens when death, who lives in an unnamed Iberian country with her taciturn scythe, falls in love with the principal cellist of a local orchestra and fails to claim his life. For this special event, excerpts from Death with Interruptions was performed in the beautiful Durant Atrium by Nikki Einfeld (Soprano), Leighton Fong and Tanya Tomkins (Cello), Jory Fankuchen and Anna Presler (Violin), and Phyllis Kamrin (Viola). Special thanks to Arts & Humanities Dean Anthony Cascardi, Professor Thomas Laqueur, and the Mellon Foundation Distinguished Achievement Fellowship program for supporting this event! On January 30th, ARC hosted an intimate gathering with food, cocktails, and a special piano performance and salon conversation with UC Berkeley faculty member, composer, and Guggenheim Fellow, Myra Melford. During the evening, Melford performed music from her recent solo recording Life Carries Me This Way, work inspired by original artwork of the late Sacramento-based artist Don Reich, which was followed by a conversation with UC Berkeley Assistant Professor of Music Tamara Roberts. 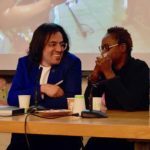 Roberts and Melford talked about the work, Melford’s role as a curator of New Frequencies Fest/Jazz@YBCA, and the course they co-taught on “Improvising Community” which explored community engagement through musical improvisation. On Tuesday, January 13, The Arts Research Center was delighted to welcome Laura Callanan, Senior Deputy Chairman at the National Endowment for the Arts for a conversation on Arts, Innovation, and Entrepreneurship with ARC Director Shannon Jackson. 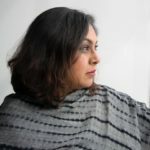 Having most recently acted as a fellow at the Haas School of Business, where she focused on developing research and platforms that position artists as innovators and social entrepreneurs, Laura revealed to our own Bay Area group tech and art innovators her intention to make arts entrepreneurship a central focus of her tenure at the N.E.A. To learn more about Laura or these topics, visit “The Suprise Social Entrepreneur” by Laura Callanan or ARC’s Past Events. 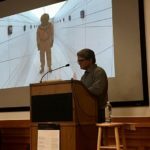 The Arts Research Center had the pleasure of hosting social justice artist and MacArthur genius Rick Lowe in November for a 10-day residency, which included a bracing conversation as part of our recurring “Salon” series. At this invitation-only salon with Rick, we talked about the obstacles and opportunities of working as an artist for social justice; we also thought deeply and expansively about how or whether to “scale” such projects, and we speculated about public sector, non-profit, and market-based models for sustaining the arts and art organizations. For more information about Rick’s stay with the Arts Research Center, please visit our event archive page. In September, ARC celebrated UC Berkeley faculty member and choreographer, Joe Goode, and the presentation of Goode’s signature works Wonderboy & 21 Effeminate Gestures.This salon event began at Caña Cuban Parlor & Cafe in San Francisco with cocktails, tapas, and a pre-performance conversation with Joe Goode, Artistic Director of Joe Goode Performance Group and Professor of Theater, Dance, and Performance Studies. ARC Salon members then attended Wonderboy & 21 Effeminate Gestures, which preceded a VIP reception at Z Space. For those who want to take a deeper dive into the history and significance of Joe Goode’s work, we suggest that you peruse the following on ARCReads: “The Silent E: 29 Effeminate Gestures 24 years later” by Selby Schwartz. Please contact Lauren Pearson for more information on attending these events and ticket prices, lauren.pearson@berkeley.edu.